The Oswego County Historical Society will host a lecture entitled “A Saint Amongst Us: The Life of St. Marianne Cope” on October 21. 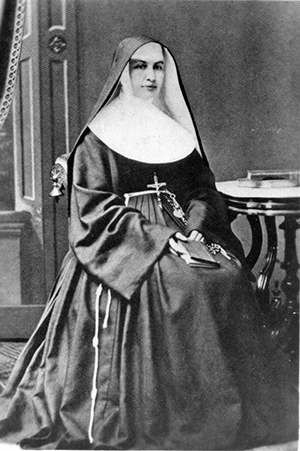 Pictured is an historic image of St. Marianne Cope. OSWEGO – The Oswego County Historical Society will host a lecture entitled “A Saint Amongst Us: The Life of St. Marianne Cope” on October 21 at 1:30 p.m. at the St. Marianne Cope Hall behind St. Peter’s Church at 83 E. Albany St. The guest speaker will be Kristin Barrett-Anderson, director of the St. Marianne Cope Shrine and Museum, organized by the Sisters of St. Francis of the Neumann Communities in Syracuse. This lecture coincides with the sixth anniversary of the canonization of St. Marianne Cope on October 21, 2012 in the Vatican. St. Marianne Cope was born in Germany in 1838. Her parents immigrated to the United States in 1839 and soon after settled in Utica, NY. In 1862, she joined the Sister of the Third Order Regular of Saint Francis based in Syracuse. She was a found member of St. Elizabeth’s Hospital in Utica in 1866. She later served as the Superior Govern of St. Joseph’s Hospital in Syracuse in the 1870s. Her greatest mission was her lifelong service overseeing the Sisters of St. Francis in the creation and management of a hospital for leprosy sufferers in the Hawaiian Islands beginning in 1883. This year marks the 100th anniversary of her death in Hawaii on August 9, 1918. St. Peter’s Church Hall in Oswego was named in her honor in 1987, as it was the church school and convent in which St. Marianne Cope served and lived. What makes St. Peter’s Church so unique is that the hall is the only building, in which St. Marianne Cope ever lived and resided, that is still standing in the entire country. In August of 2013, through efforts made by the church congregation, a statuary shrine in her memory was placed next to the main altar in the church. The imposing statue was commissioned and created by artisans in Brazil. The Oswego County Historical Society is a non-profit organization founded in 1896 and dedicated to the collection, promotion and interpretation of the historical resources of the county. It owns and operates the historic landmark Richardson-Bates House Museum at 135 E. Third St. in Oswego. The museum is open for tours Thursday – Saturday from 1 to 5 p.m.
For more information, visit www.rbhousemuseum.org or call during regular hours at 315-343-1342.